Does your child resist your best efforts by refusing any novel food you put in front of them? Here are some ideas that will help you remove the stress from the process of encouraging your preschool child to eat well, and some tips to making the process easier for everyone. Set reasonable limits for the start and end of a meal and be sure you stick to them. If your toddler hasn’t eaten much at the end of ten minutes, let them leave the table anyway. Sitting over unwanted meal makes them unhappy and you tense and sets a precedent for the next meal which is exactly the opposite of what you want to achieve. Offer a new food at the beginning of the meal or as a mid-morning snack, your child is most hungry now and less likely to be unreceptive to new foods. By afternoon they may be tired and still full from earlier meals so you’re setting yourself up for failure if you introduce a new food then. When giving your child a new food, don’t lecture or tell them how good it is for them. Until children are around eight, they have no idea what good or bad food means, and much prefer to hear about how a new food grows, where it comes from or what animals eat it too. Cooking together allows children to ‘play’ with ingredients and become familiar with them, this is a great way to get them to try something new without realising it, as they are unfamiliar with most foodstuffs in their raw state anyway. Psychological studies show that for children and adults alike, learning to enjoy new foods can take time. Children in particular are suspicious of new tastes and textures and it can take up to a dozen samplings for a child to accept something they aren’t used to. Don’t give up too soon and don’t make a big deal of new foods because that immediately puts your child on the defensive. When introducing new foods do so in very small portions. It’s not just the tastebuds that need to adjust, a small child’s digestive system can need time to get used to a new food too and if a child associates a new food with a painful tummy, it will be much more difficult to persuade him or her to eat it again, even if they seemed to enjoy it the first time. Tiny portions allow the whole system to adjust. Instead of offering your child a new food, eat it yourself, praising its taste and smell and only let them have a bite when they ask – begging for something always increases the desire to have it when you get it! Offer only one new food at a time and serve it alongside something quite similar – mashed potato alongside pureed carrot, for example. Anything too dissimilar can seem strange. Similarly, don’t serve a new food alongside your child’s current favourite as there’s no incentive to try something new if he or she is already looking forward to something else they can see on the plate. Serve food separately if your child prefers it that way: instead of spaghetti bolognaise, for example, serve a single meatball, some plain pasta and some of the tomato sauce in separate containers. 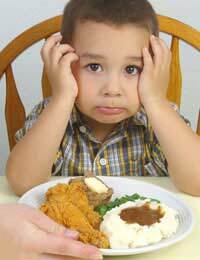 Many children will ‘dunk’ food in a sauce but won’t eat it if it arrives in the sauce already – this is related to having control of something, which is an area many 2 – 4 year olds feel very strongly about.